It’s a well-known fact that southeast Arizona in summer is awesome. At least for birders. My first birding trip ever was to Arizona. I signed up because it was in summer, the only time of year I could then take a vacation; I was a beginning birder, right at the beginning of beginning, and I didn’t know enough to look at a Plain-capped Starthroat (thank you again, Megan, for forcing me to look) or why I was almost run over by the birders in my group when Common Black Hawk was called out . I saw a lot of birds, learned a lot about birding (including the fact that I had lousy binoculars), and gained good birder friends. Now, years later, it was time to return. I had a list of birds I had missed and a list of birds I needed to see again—second lifers I call them. Here are some of the best experiences of my excellent trip. 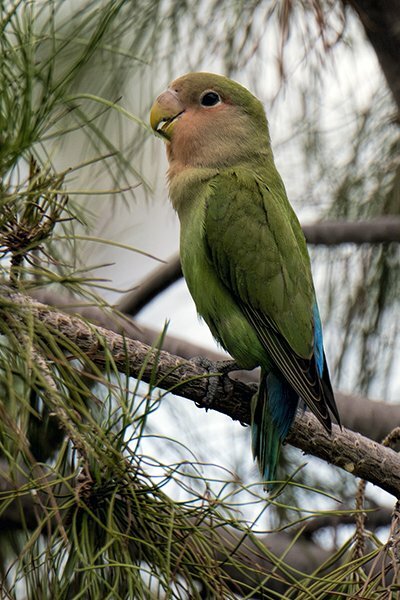 One thing that had changed since my 2003 trip was that Rosy-faced Lovebird was on the ABA Checklist (and that I knew what that was). So, I flew into Phoenix, Lovebird Central, and three hours after I got off the plane had a lovebird in my binoculars, at Encanto Park. The bird was a little harder to find than I expected; I needed to triangulate the sounds of the call and finally, after standing and looking and walking around the tree where the bird had to be calling from, I took a deep breath, looked again, and there it was right in front of me, actually at eye level. It is amazing how parrots and parakeets can totally blend into their surroundings. Finding the lovebirds so easily meant that I had time to bird Phoenix and, at the suggestion of my friend Allison, a Phoenix birder and sculptor, I spend time at the Desert Botanical Garden early the next morning (Phoenix, I discovered, is hot, and even early evening was over 100 degrees.) This was a wonderful re-introduction to the desert species I was seeking. As I drove through Papago Park to the Garden, I spotted coveys of Gambel’s Quail, parents herding exuberant chicks. A Cactus Wren nest is right at the entrance, and I saw and heard the wrens everywhere, as well as Anna’s Hummingbirds, Black-tailed Gnatcatchers, Verdin (most young, without their yellow heads yet), White-winged and Inca Doves. But, it was the Curve-billed Thrashers that were my bird of the morning. 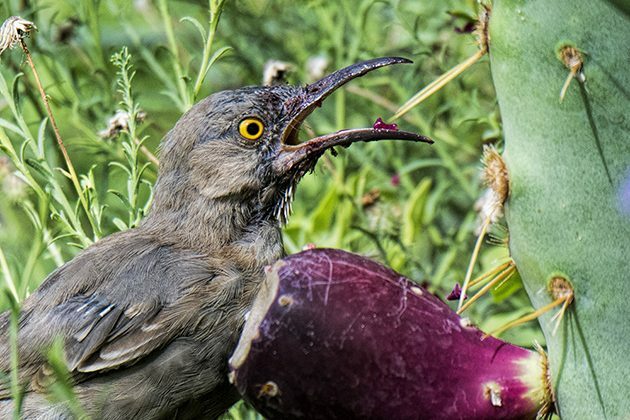 They were everywhere–crying out, scaring off lizards and Canyon Towhees, skulking, and out in the open, gorging on Prickly Pear, like the bird above. I managed to get some video of this greedy thrasher before a family walked down the path, and you can view it here. It was time to drive south and up, to the Sky Islands of southeast Arizona. It was early evening when I was approaching the road to Ramsey Canyon and, having not had a good bird for several hours, I took a Cassin’s Kingbird on a wire as a sign and turned off onto a road. Just a regular road, nice houses on one side, land put aside for preservation on the other. 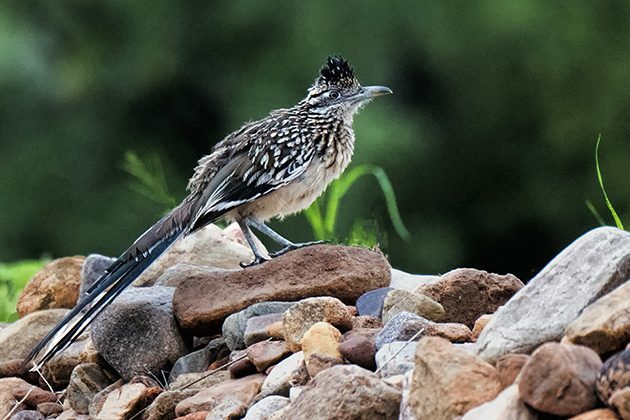 A Roadrunner crossed in front of me. 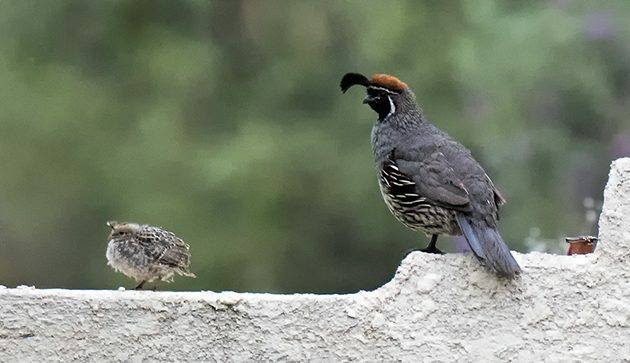 Coveys of Gambel’s Quail marched through front and back yards, and I watched as a father encouraged his little ones to jump onto a low wall. A Ladder-backed Woodpecker and then Lesser Goldfinches flew onto the tree next to me as I observed the Roadrunner feeding in an empty lot and a Cactus Wren called from the other side of the lot. I was in birder heaven. 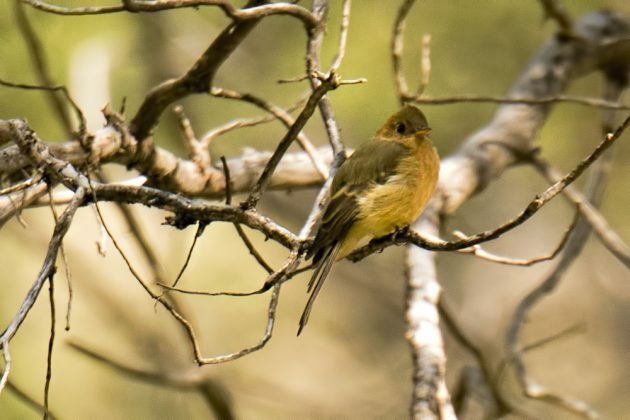 I had two days in the Ramsey Canyon area, and I focused on life birds. Early my first morning, I drove to the famous Ash Canyon B&B. 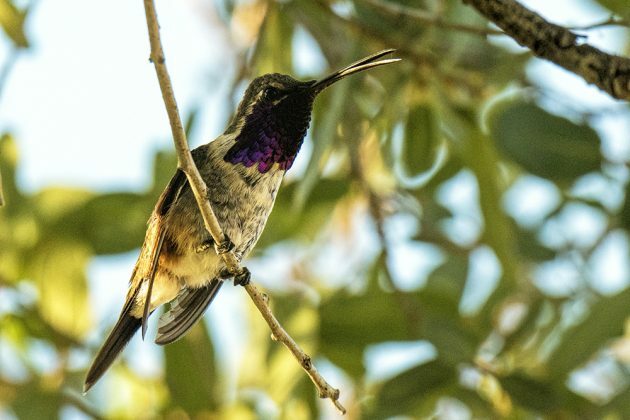 My goal was Lucifer Hummingbird, but I didn’t do enough research to know that the best time to see the hummingbird is in the early evening. I was the only birder there! This turned out to be a good thing, because the feeding areas (there are two, three if you count the photographer’s blind area) were energetically alive with Black-chinned, Broad-billed, Broad-tailed, Rufous, Anna’s, Rivoli’s (formerly Magnificent) Hummingbirds, and even a Costa’s, as well as Acorn, Ladder-backed, and Gila Woodpeckers, Bewick’s Wrens, Mexican Jays (loud, of course), Black-headed Grosbeaks, and more. I also got a chance to chat with Mary Jo, the B&B’s owner and host, who is justifiably proud of the bird paradise she’s created. Mary Jo kindly allowed me to use the photographer’s blind for half-an-hour, which is where I saw the Lucifer’s Hummingbird. 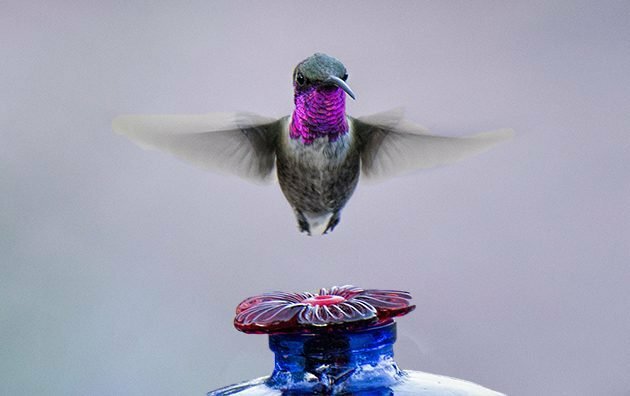 It turned out that I saw a number of Lucifer Hummingbirds on this trip–at the Ash Canyon B&b on my own and a week later with my New Jersey Audubon group, and in Portal, courtesy of a homeowner who had up to five coming to his feeders, and who kindly allowed my friends and I access. These photos (the one above and the header) are from the N.J. Audubon trip, which was at the better time–between 4pm and 6pm–but very different from my morning visit, with every seat filled and quiet reigning under Mary Jo’s watchful eyes. Two days later, after dipping on Flame-colored Tanager but feeling very fit after doing the hike up Ramsey Canyon to the spot where seemingly every birder but me has seen it, I traveled on to Portal and the Chiricahua Mountains. Portal has a legendary connotation in birding circles, and for good reason. Geographically isolated from a decent supermarket, home to one restaurant–the excellent Portal Cafe, it is rich in birds, butterflies, dragonflies, scorpions and all kinds of creepy crawly creatures, jackrabbits and naturalists. I think it must have the highest density of naturalists/birders to lay people of any place I’ve been. 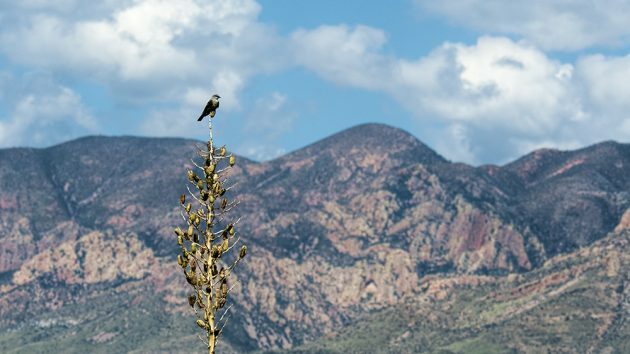 It is an incredibly beautiful place, where fiery sunsets rival fog wrapping around the Chiricahua peaks in the morning and where sights like that above, a Western Kingbird poised against the mountains are so everyday you wonder that its residents never lose their wonder. My friends Lori and Mark Conrad hosted my visit with an eagerness to get me lifers. I kept telling them I was happy simply observing their backyard, which they have developed into a birding habitat of national repute (many birders got their life Plain-capped Starthroat in the Conrad yard in past years, and this summer they were being visited by a Calliope Hummingbird). 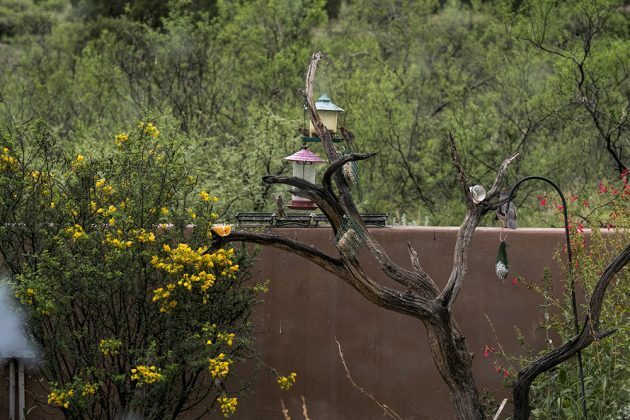 This was the only place in my Arizona sojourn where I saw Pyrrhuloxia, a Calliope, Scott’s Oriole, and Crissal Thrasher, as well as Lark Sparrow, Black-throated Sparrow, Painted Bunting, Hooded Oriole, Bridled Titmouse, and many more species, including the Barn Swallows nesting on the back porch. 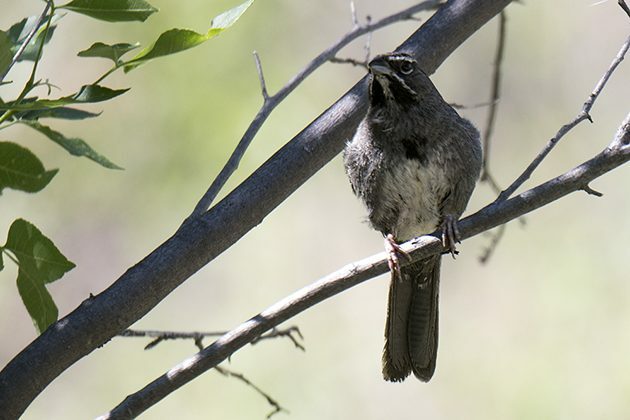 But, Lori and Mark were not to be deterred, and I happily allowed them to find me Mexican Chickadee, Bendire’s Thrasher, Red-faced Warbler, and Plumbeous Vireo–all lifers. 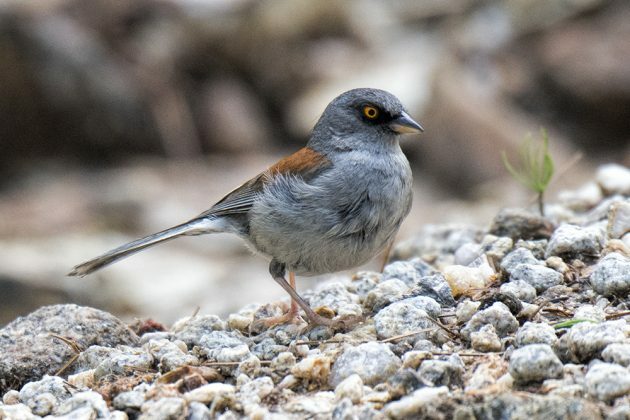 Plus, great looks at Cassin’s and Botteri’s Sparrows, Grace’s Warbler, Blue-throated Hummingbird (including a nest), and Antelope Jackrabbits (not a bird). And, Montezuma Quail. 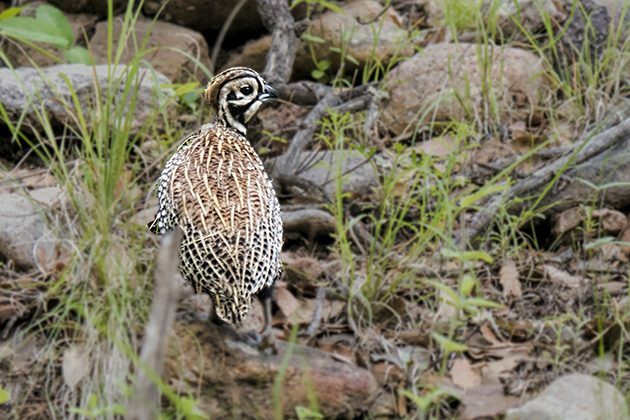 I don’t think I’ll ever get a better look at Montezuma Quail as the one I got in South Fork. This is apparently a Conrad speciality. There was one dip, and it was Elegant Trogon, which Mark found at the exact same time I was using the South Fork bathroom in Cave Creek Canyon. Yes, the old missed-it-cause-I-was-in-the-latrine. This was frustrating because we wanted to chase the bird, which meant going higher, and high water levels at the creek prevented that. And, the life birds kept a’coming, with Rufous-winged Sparrow at Madera Canyon, Rufous-crowned Warbler and Greater Pewee at Miller Canyon, Elegant Trogon at Huachuca Canyon, and Olive Warbler, Buff-breasted Flycatcher and Tufted Flycatcher (above) at Reef Townsite. I was particularly excited about the latter two birds. I was tempted to drive to Reef Townsite while I was on my own earlier in my trip, but a little research convinced me that this was not a good thing. I needed a driver, a driver who was not scared of one-lane dirt roads that had a mountain on one side and a drop on the other and that went relentlessly up, up, up. Fortunately for us all, Linda is such a driver. I had one last day on my own once the N.J. Audubon trip ended. It is my experience that good things happen after trips and festivals end. In fact, I’m going to make this into a rule. In this case, a couple of Five-striped Sparrows had been found in Montosa Canyon, a place we had birded just before word got out. Unlike other locations, this one was easy–no hiking, minimal time on a dirt road, and cooperative birds. Actually, it took me a while to see the sparrows. There were a couple of birding festivals in progress in Arizona, and I arrived on the heels of several groups. I was wishing for the eyes of my New Jersey friends as I saw Verdin, Black-throated Gray Warblers, and listened to an incredibly loud Northern Cardinal, when I walked a little bit away from “the spot” and saw one of the sparrows, calling from a small tree. It was the best way to end my second trip to Arizona, the one where I used good binoculars. Happy to see that you had an excellent trip! WOW!! What an amazing trip! That is a spectacular list of birds. Thanks for the comments, Pat and Tom! Took me a while to get back to you because I’ve been in Brazil. This is my magic traveling year. Where Are You Birding This Fourth Weekend of August 2014? 301 Snowy Owls in One Weekend! Where Are You Birding This Fourth Weekend of December 2012?